Space Scouts was created by Carol Stump a mother with an established and successful 25 year career in the Aerospace Industry who has a passion for the night sky. And it was her passion for children and space that led to her vision for Space Scouts. Space Scouts is a monthly subscription club that engages children ages 6+ with fun learning activities, hands-on discovery, and exciting challenges all about space! 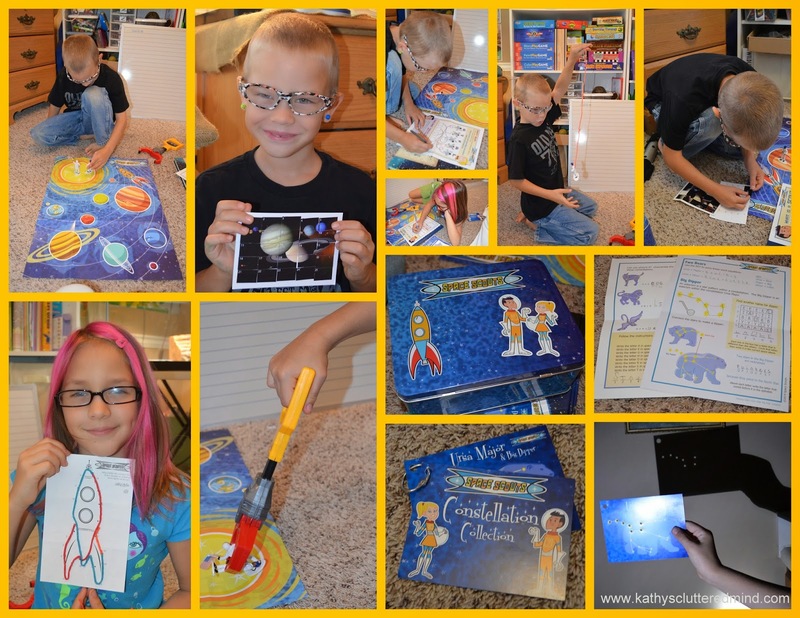 After receiving the introductory kit in the first month, children receive the following in subsequent months: activity sheets, a constellation card and information sheet, magnet, space toy, and more, all around a space theme. We received the introductory kit and subscription month #2 kit for the purpose of this review. The children immediately tore the package open and began to oh and ah over all the fun goodies included in the package. They begged to get started right away...which we did! This kit includes program introduction, Space Scouts lunch box, solar system poster, activity sheet, sticker scramble, souvenir toy, constellation card cover and ring and constellation card introduction. The lunchbox and toy were probably their favorite items. The metal lunchbox is very cute and sturdy and offers the perfect place to store future materials. We first read over the program introduction so we could learn more about space scouts and our adventure buddies Roxy and Jett. Next we read over the information sheet on constellations and learned things like: what they were used for long ago and what the meaning of the word constellation is. Each month children are introduced to a new constellation and receive a new card to add onto their constellation ring. Next we moved onto the sticker scramble and activity sheet. My son age 7 completed the sticker scramble and my daughter age 8 completed the activity sheet (they switched on the month #2 kit). My son really enjoyed the scramble and loved the end result which was a photograph of our solar system. My daughter had no trouble with the activity sheet which included 3 activities: decoding, mini crossword and word search. After she completed the activities she shared what she had learned with her brother. Next it was time to play! The souvenir toy was a set of Wiki Stix along with a dot-to-dot space picture. This was my children's first experience with Wiki Stix and they fell in love. They spent almost 20 minutes playing with them and they are in for a treat because they will have a large set of Wiki Stix under the tree for them at Christmas. And last, but not least we took a look at the solar system poster. I reviewed the planets with the children and we hung it up in our homeschool room. In future kits there are stickers that get added to the poster. The poster was quiet large, brightly colored and made from thick, glossy paper. The children were having so much fun that they decided to move right onto month #2. This kit contained 2 mini astronaut plastic figures, Space Scout stickers, Space Scouts magnets, sticker scramble, souvenir toy, a constellation card, 2 activity sheets, and a constellation activity sheet. In this kit the children learned all about Ursa Major & Big Dipper. They loved the story about the constellation and the activity sheet which included a word equation, dot-to-dot and decoding. We then grabbed the constellation card and headed to a dark bathroom to light up the constellation with a flashlight so we could view it on the wall. It was so much fun. Next Gwyn worked on the sticker scramble and Rowyn worked on one of the activity sheets. Rowyn did a great job and required only a little assistance with the space suit match up activity. After he was done he shared what he had learned with his sister. They both thought that the floating food was pretty funny. Gwyn completed the second activity sheet which explained what an astronaut's job was and then had you draw yourself as an astronaut...Rowyn drew his astronaut picture on a separate piece of paper. Afterwards they placed their Space Scout pictures onto their poster and put the Roxy and Jett magnets onto the front of the lunch box! And finally it was time to play with the toy souvenirs. The activity sheet included a couple fun challenges which kept the children busy for quite sometime. The first challenge was to use the robotic arm to pick up the toy astronauts. Next they had to try to turn off a light, turn on a water faucet and even make their bed. They had an absolute blast. The Space Scouts subscription is perfect for children ages 6-9 years old. It appeals to all learning styles and does a great job engaging children and getting them excited about space exploration, space science, astronomy and even technology. The kits are high quality and you can definitely tell that a lot of thought is put into each kit. If you are a homeschooler these are the perfect compliment to any astronomy curriculum. 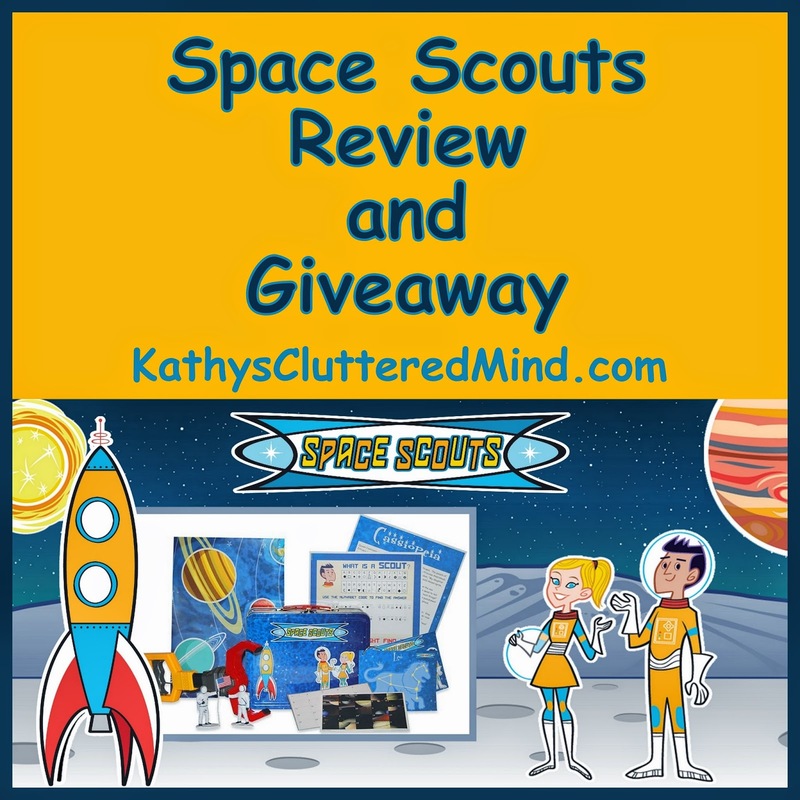 Space Scouts is not your typical grab-bag subscription box! This is a fun, educational experience where each month builds upon the previous. Space Scouts is only $11.95 per month + $3 shipping. Discounts for multi-month purchases. This subscription makes a great gift! One winner will receive an introductory kit and #2 kit from Space Scouts. Only the first entry is mandatory. Other entries are optional and give you extra chances. This giveaway is not affiliated with Facebook in any way. The winner will be posted on the blog and will be emailed. Winner must reply within 424 hrs with their contact information or another winner will be chosen. Jayden says earth and Julianna says she doesn't know yet.